Premier Dance Studio - Located in Cary, NC. 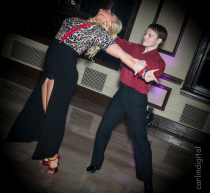 We teach ballroom Latin, Smooth, Swing, Argentine tango and more! WE TEACH ALL KINDS OF PARTNERED DANCE: Ballroom, Latin, Swing, Lindy hop, Balboa, Salsa, Bachata, Argentine tango, West Coast swing and much more!! Need to get ready for your wedding dance? Wedding couples, father-daughter, mother-son, or entire wedding party dances are welcome. We're not your "average ballroom studio." In addition to the ballroom styles, we also teach the dance styles seen at the local swing, salsa, tango, blues, and West Coast swing venues around town. Click here to view video performances by our professional instructors. More videos and photos of our Showcase events and other parties can be viewed in our Gallery.